July 1985. Sevastopol. Photo from the archives of А. Kostenich. Class, [Type]: Riga ( Project 50 ), [FF]. Builder: Shipyard named after 61 Communards, Nikolaev, USSR. Launch date: 10 Yuly 1956. Commission date: 12 April 1957. Displacement ( tons ): 1068 standard, 1330 full load. Dimensions ( metres ): 91,5 x 10,2 x 3,4. Main machinery: 2 x TB-9 geared turbines ( 20000 hp ). Range ( miles ): 2000 at 14 knots. Guns: 3 x 1 V-34 100mm, 2 x 2 B-11-М1 37mm. A/S weapons: 2 x 16 mortars RBU-2500; 4 x 1 BМB-2. Torpedoes: 1 x 3 533mm torpedo tubes. Radar: Air: Fut-N; Surface: Neptun-M; Fire Control: Yakor M-2, Sfera-50. 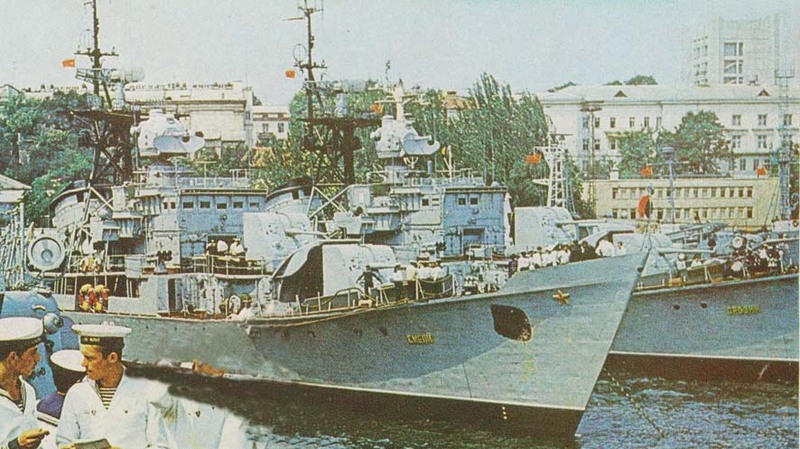 Comment: Ex-USSR NAVY ship SКR-67.